This is a Countrylane homes review of the website. 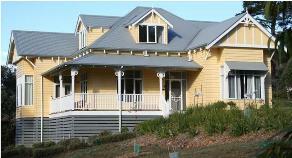 "At Country Lane Homes they design and build character style homes to perfectly suit the Australian environment. With quality timbers plus a huge range of options, they create beautiful cottage style homes, as well as a contemporary range to suit country, the seaside or city living. Whether you prefer a classic French style, early Federation or a Victorian style home their character homes always reflect a lifestyle and personality of warmth and comfort. From six classic styles, they tailor their design to suit the property outlook and preferences, creating a beautiful character style home with functional layouts and elegant finishes." (Webcopy) For home builders, all homes are available as 'build your own' home kits. Kit homes Victoria provider.